This page is about the M2HB (12.7 mm) mounted on ground vehicles. For the aircraft-mounted variant, see Browning M2 (12.7 mm). For other uses, see M2 (Disambiguation). The Browning M2HB is an American .50 cal (12.7 mm) heavy machine gun, it is a variant of the legendary Browning M2 machine gun. The M2 is by far the most ubiquitous machine gun in the game; the airborne Browning M2 is found somewhere in every nation's (apart from Italy's) aircraft tree, the ground based M2HB is found in every nation's tank tree, and the naval based AN-M2 is found in the US naval tree. Being a 12.7 mm heavy machine gun the M2HB has an okay amount of armour penetration, and higher damage output than medium and general purpose machine guns. This makes it much more effective at engaging weakly armoured enemy tanks, as well as aircraft. This machine gun is present on most America tanks, as well as on at least one tank from every other nation's ground vehicles tree. The M2HB is a fairly standard 12.7 mm heavy machine gun, with ok rate of fire and a good belt capacity. In it's most common role as a secondary (co-axial or pintle mounted) machine gun the M2HB can only be equipped with one ammo belt consisting of one Armour Piercing Incendiary Tracer (API-T) bullet, followed by one Incendiary (I) bullet, followed by one Armour Piecing (AP) bullet, followed by another API-T bullet. The AP bullet has the most penetration at 26 mm maximum, followed by the API-T bullet with 23 mm maximum. The incendiary bullet has very poor penetration with a maximum penetration of 2 mm. The M2HB is also used as the primary weapon on some vehicles (predominantly SPAA, but also tanks such as the M2A2). In these cases the M2HB can be equipped with a number of different ammo belts. While none of these belts contain a higher maximum penetration than the default belt (26 mm), they consist of different combinations of rounds. The M2HB performs functionally identically to the M85 (12.7 mm) machine gun, the only other 12.7mm machine gun used by the Americans. Like the M85 it has a slightly lower rate of fire than other 12.7 mm machine guns, but has a larger belt capacity. 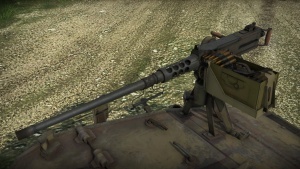 Unlike lower calibre machine guns the M2HB has enough penetration to be able to penetrate the armour of lightly armoured tanks (or the side / rear armour of some more heavily armoured tanks, bullets can also sometimes make it through armour holes such as the turret ring, or mg port of tanks, injuring crew members. Like all other machine guns it can be used for incapacitating exposed crew members, as well as marking enemy vehicles and obscuring the view of enemy players (shooting at their gun sight). It also does more damage to enemy aircraft than lower calibre machine guns, and is usually mounted on top of the turret, making aiming at aircraft much easier than with a co-axial gun. Clearing trees and bushes is another use. The M2HB is an American .50 cal heavy machine gun, cambering the .50 BMG (12.7×99 mm NATO) round; it is the "Heavy Barrel" version of the legendary Browning M2 series of machine guns. Machine guns used in the First World War tended to be of rifle calibre, however towards the end of the war it became apparent that larger calibre weapons were needed in order to defeat armoured vehicles and aircraft. In mid 1917 John Browning set about redesigning his M1917 machine gun (the same weapon the .30 cal M1919 was developed from), to chamber a .50 cal (12.7 mm) round. The new weapon was tested in October 1918 and was found to have poor rate of fire and inadequate penetration, as well as being heavy and hard to control. Further development work to improve the weapon's short comings resulted in the M1921, a .50 cal water-cooled machine gun, which entered testing 1921. The M1921 entered service with the US Army and Navy in 1929. The weapon was very heavy at 121 lb (55 kg) and concerns were raised about it's suitability for the role due to it's extreme weight and the rapid overheating of the air-cooled version. After John Browning's death in 1926 work on the M1921 continued with a slightly improved M1921A1 version entering service in 1930. The M1921 was re-engineered with a new receiver design, and in 1933 it entered service as the M2 Browning. The initial Browning M2s shared the same water-cooled barrel as the M1921 (and thus the same heavy weight of 55 kg). Like the M1921 the M2 proved to overheat rapidly without water cooling and so the M2HB (HB standing for "Heavy Barrel") was developed. The M2HB had a thicker and heavier barrel to help dissipate heat, as well as featuring the weapon's iconic short perforated barrel support and carry handle. Despite featuring a heavier barrel, the ditching of the water cooling system meant that the weight of the weapon could be reduced down to 84 lb (38 kg). The M2 family saw widespread usage by the Allies in WW2 being mounted on armoured (un-armoured) vehicles, aircraft and ships; the M2 was also supplied with a tripod to infantry. The M2HB was pintle mounted on tanks and other armoured vehicles, as well as on jeeps and trucks; it was also mounted on tripods for use by infantry. After the war a plan was made to replace the M2 with the M85, however the new weapon proved to be extremely unreliable and was withdrawn from service (ironically being replaced by the M2). Although the M2 Browning is mostly no longer used on aircraft (being replaced by the M3 and the by larger calibre cannons), the M2HB remains in service to this day with a wide range of nations. It is used on armoured vehicles, boats and by infantry. From 2010 the US army began replacing the M2HB with the upgraded M2A1 version, featuring a quick change barrel a flash suppressor, and other improvements, the upgrade process is still ongoing with the plan being for all 54,000 of the army's M2 Browning machine guns to eventually be upgraded to M2A1 spec. The Browning M2 remains the most produced heavy machine gun of all time with over 3,000,000 being built. This page was last edited on 20 March 2019, at 23:15.